Energy Dispersive X-ray Spectroscopy (EDX is used to determine the composition of a sample such as thin films. 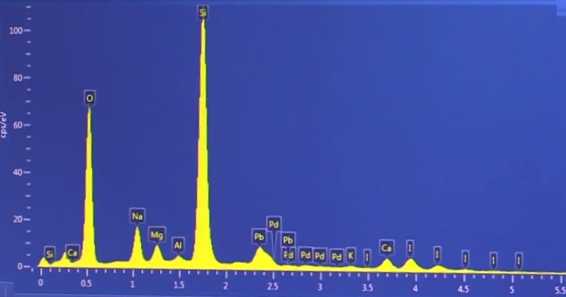 Not only can relative amounts of each atom be measured, but the distribution of the atoms in our samples can be mapped. EDX is an extension of the Sirion Scanning Electron Microscope in the Molecular Analysis Facility, make sure to watch our SEM videos before continuing. How does EDX determine composition, or, in other words, differentiate between atoms? In general, atoms are composed of nuclei (protons and neutrons) with electrons orbiting around them at different energy levels. During SEM operation, a high-energy electron beam impinges on the sample. Some of these electrons collide with electrons residing at lower energy levels, and both scatter and leave the atom. As a result, an electron located at a higher energy level sees the vacancy and jumps at the opportunity to reside at lower energy level. When the electron moves to this lower energy level, it releases energy – specifically, x-rays. Because these electron transitions are characteristic of the specific element, the energy of these x-ray emissions is also characteristic of the element. You’ll also see that multiple electron transitions for an atom are possible because electrons can fall from different elevated levels.